Download this whitepaper to learn the five issues that IT needs to think about around DNS and why, as well as how you can build a strong DNS foundation to maximize use of resources, secure DNS, and increase service management, while remaining agile. The Domain Name System is one of the most important components in network infrastructure, but current network loads from increased cloud and mobile access, as well as future solutions, place considerable stress on DNS infrastructures. 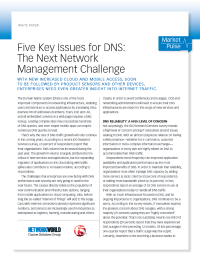 IDG Research has found that there is a high level of concern among IT executives around issues related to DNS. Not surprising, given that organizations have become so reliant on their web presence and, as such, DNS in order to accommodate their web traffic.